We understand IT security is an extremely critical aspect to organizations. IT Security is probably more vital to your organization than the industry on average considering you are actively looking into a third-party patch management solution to help reduce vulnerabilities. We often get asked how we validate the integrity of the third-party updates included in our catalog. This question is crucial for you to understand. In this post, we will describe in detail the procedures we take to ensure the quality and integrity of the patches we publish in our third-party software update catalog. The first step in our process for creating an update is to download the update binary (EXE, MSI, or MSP) from the official vendor’s download mirror. This update binary will be the file executed on client computers to update the product. The original hash of the binary and download URL is stored in our catalog metadata. The download URL is what will be used when downloading and publishing the update within your environment. Whenever we add new updates to our catalog, the catalog metadata gets exported and saved into a CAB file. This catalog (.CAB) is imported into your environment and used to publish updates. 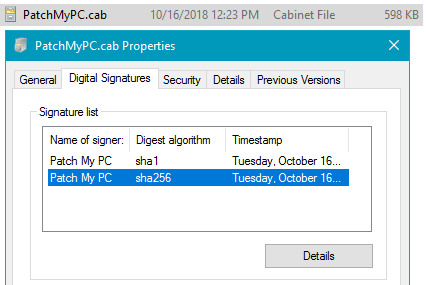 To ensure the integrity of the catalog when downloaded and import to your environment, we dual code-sign the catalog file with our code-signing certificate. 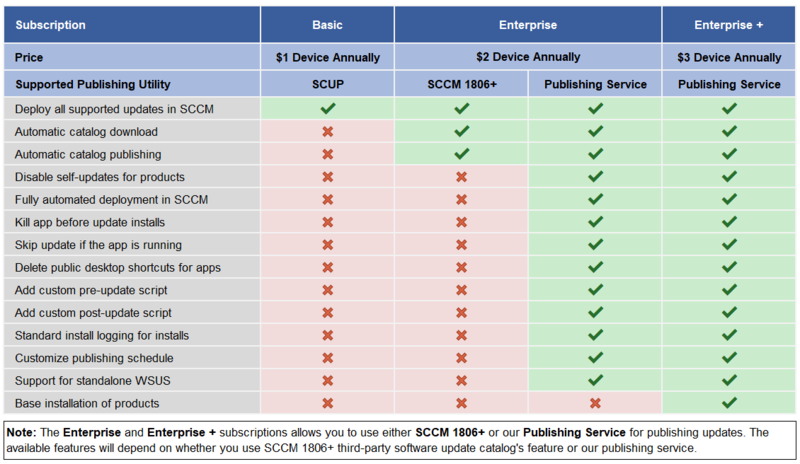 When the catalog gets downloaded in your environment, the import will only occur in our publishing service, SCCM 1806+, or SCUP if the catalog is code-signed from a trusted publisher. Once we obtained the vendors binary and file hash, we then will then upload the binary to VirusTotal. 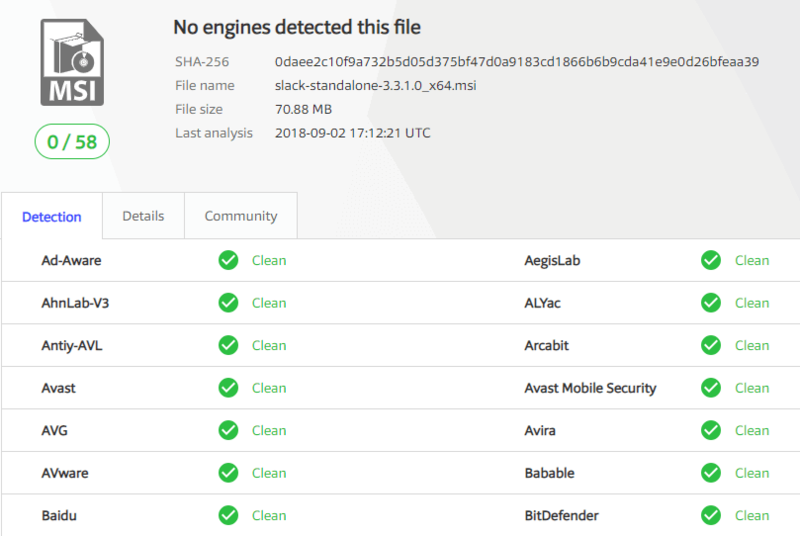 VirusTotal will analyze the binary file through 55+ anti-virus engines. Here’s an example of the Slack 3.3.1.0 MSI binary file from Step 1. We post all VirusTotal results for any third-party updates released in our RSS feed and email newsletter. These results will include the archived VirusTotal scan from our scan as well as a link to the latest VirusTotal scan for the binary. 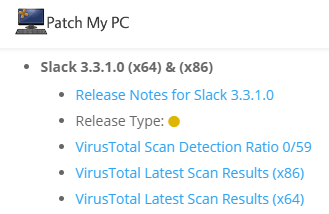 We also maintain a complete repository of every update binary at the time of our scan on the VirusTotal Scan Reporting page. Before the catalog metadata evaluated for publishing, there is a digital signature check on the downloaded catalog file. This check validates the catalog is signed from Patch My PC. Once the catalog is validated, only then will the catalog metadata be evaluated for processing. Since we don’t control the servers used for content downloads, it’s essential to ensure the file downloaded from the vendor’s website is the exact same file used when initially creating the update that went through the VirusTotal scans. When an updated binary is downloaded, we will compare the hash of the downloaded binary with the hash from the catalog and only publish the update if they match. The final layer of trust for third-party software updates before client-side installation is between your servers and clients. 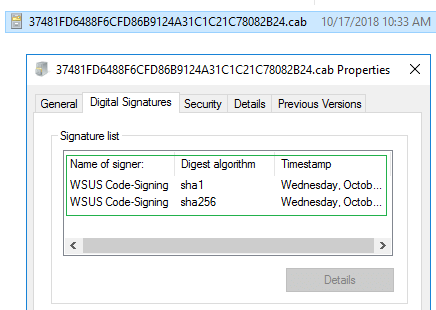 Whenever third-party updates are published to your WSUS environment, they are added into a CAB file that gets digitally signed using the code-signing certificate that you configure within your environment. Client devices will only install third-party patches that are signed using a trusted certificate that you have configured and deployed to your devices. If you have any more detailed questions about our security testing, please reach out to our team using our contact form.